Follow the young Johann Wolfgang Goethe (Alexander Fehling) in 1772 as he struggles in his budding career as a lawyer even as he yearns to be a poet. After failing his law exams, he is sent by his father (Henry Huebchen) to the sleepy town of Wetzlar to toil as a law clerk and mend his ways. Soon after arriving, Johann meets the boisterous, crimson-tressed Lotte Buff (Miriam Stein), and the two fall in love. But their road to romance is filled with obstacles--employers to be obeyed, fathers to be heeded and duels to be contemplated--and hearts are destined to be broken. Such are the affairs of the heart and head that inspire a young poet--a poet who will soon go on to pen one his most vital and influential works. Chicago, IL (March 15, 2012) - Johann Wolfgang Goethe remains Germany's most famous and important poet and philosopher, a mythic figure who has universally been regarded as a genius for more than 200 years. The inspiration that sparked Goethe's rise to greatness is the subject of Young Goethe in Love , a beautifully innocent yet achingly insightful romantic drama about the 23-year-old Johann Goethe, his summer of self-discovery and unrequited love, and the birth of the first-ever literary superstar. Featuring an all-star cast, including: Alexander Fehling (Inglourious Basterds), Moritz Bleibtreu (Much, Run Lola Run), Burghart Klaussner (The White Ribbon), and Volker Bruch (The Reader), Young Goethe in Love makes its DVD, VOD and Digital Download debut on April 24 (prebook March 20) by Music Box Films Home Entertainment. Released theatrically in 2011 to acclaim around the world and in the U.S.'s top markets, the DVD disc will carry special bonus features including a 'Making Of' featurette for the suggested retail price of $29.95. Directed and co-written by acclaimed international filmmaker Philipp Stoelzl (North Face), Young Goethe in Love follows the young Johann Wolfgang Goethe (Alexander Fehling) in 1772 as he struggles in his budding career as a lawyer even as he yearns to be a poet. After failing his law exams, he is sent by his father (Henry Huebchen) to the sleepy town of Wetzlar to toil as a law clerk and mend his ways. Soon after arriving, Johann meets the boisterous, crimson-tressed Lotte Buff (Miriam Stein), and the two fall in love. But their road to romance is filled with obstacles--employers to be obeyed, fathers to be heeded and duels to be contemplated--and hearts are destined to be broken. Such are the affairs of the heart and head that inspire a young poet--a poet who will soon go on to pen one his most vital and influential works. Filmed against the backdrop of the gorgeous German countryside and filled with sumptuous 19th Century costumes and evocative scenery, Young Goethe In Love is as much a feast for the eyes and ears as it is for the heart and soul. A richly detailed historical flight of fancy in the tradition of such romantic period works as Amadeus and Shakespeare in Love, Young Goethe in Love offers "many period charms, fine actors and lovely landscapes" according to John DeFore of The Hollywood Reporter, while Ben Sachs of Chicago Reader confirms that it contains "energetic lead performances." Enlightening, entertaining and unabashedly romantic, Young Goethe in Love offers an undeniably fresh and free-spirited look at the earlier years of one of the key figures of world literature. 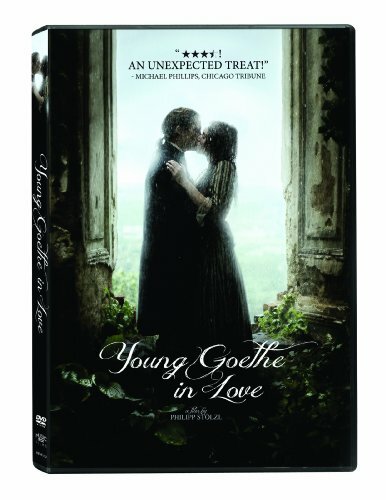 More information on Young Goethe in Love can be found on the MUSIC BOX FILMS website at http://www.musicboxfilms.com/young-goethe-in-love and the film's website at http://www.younggoetheinlove.com/. In Germany, 1772, the young and tumultuous Johann Wolfgang Goethe (Alexander Fehling) aspires to be poet. But after failing his law exams, he is sent by his father (Henry Huebchen) to a sleepy provincial court in the small town of Wetzlar to mend his ways. Unsure of his talent and eager to prove himself, Goethe soon wins the praise and friendship of his superior Kestner (Moritz Bleibtreu). Not long thereafter, the beautiful and exciting Lotte (Miriam Stein) enters his life and nothing is the same. But the young lovers are unaware that Lotte's father has already promised her hand to another man, a reality that threatens to shatter the innocence of youth--while igniting Goethe's heretofore unseen talents at the same time. Founded in 2007, Music Box Films has quickly established itself as one of the leading distributors of non-English language feature films in the US in theaters, on DVD and Blu-ray, and via Video-on-Demand. Music Box's release of Guillaume Canet's Tell No One was the most popular foreign-language film of 2008. In 2010, the film adaptations of Stieg Larsson's trilogy of international mega-sellers dominated the foreign-language film market: the first in the series, The Girl With the Dragon Tattoo, was one of the most popular international releases of the decade with over $10 million in US box office. Music Box Films is independently owned and operated by the Southport Music Box Corporation, which also owns and operates The Music Box Theatre, Chicago's premiere venue for independent and foreign films.